CF Machine and Tool fabricates parts according to client's specifications. Quality and precision are the primary objective of C F Machine and Tool. 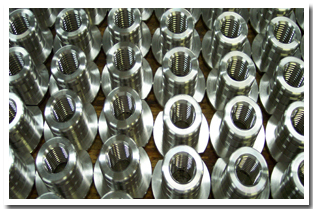 The company prides itself on its ability to meet even the most rigid precision requirements with tolerances to 0.0002. We are ISO certified to 9001:2000. In order to consistently exceed clients' expectations, C F Machine and Tool is dedicated to keeping abreast of the latest technology and equipment. Current equipment capabilities include: Milling centers up to 20" x 40", turning centers up to 10" O.D., and conventional lathe up-to 15" x 60". Our latest purchase is the Okuma Captain model L370BBW with dual spindles and the new Thinc controller. In addition C F Machine and Tool utilizes Mastercam Cad/Cam software.